The Basslines SMB-4DS electric bass pickup can make your great playing Music Man sound even better. 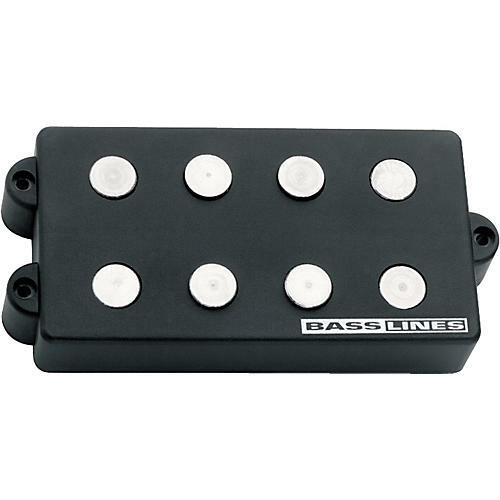 The Bassline Pickup is a powerful 4-string, ceramic magnet pickup and special 3-band tone circuit. The SMB-4DS pickup is specially designed to bring out the best tone of the mid- and late-'70s Stingrays. The hum-canceling Bassline pickup offers a highly musical tone contour with a richly articulated bottom, major midrange, and lots of treble. And the Bassline pickup has a nice, mild bark without being overly brash. Nor is at all harsh in the midrange. The low end is full and strong without being mushy or foggy. The Bassline pickup's Tone Circuit preamp will squeeze out every drop of tone your bass is capable of yielding. Lows are deep, clear, and tight. Mids range from ultra-smooth to punchy and all points in between. The Bassline Pickup's treble control produces a very wide, very usable response that is brilliant, yet smooth without any brittleness. Pulling up on the volume knob engages the proprietary Slap Switch, a special EQ contour made just for slap-style playing. Push the volume back in and you're back to your 3-band preset. All of this is available in an amazingly quiet onboard package. The Bassline pickup is best used wired in parallel.